The window was a special exhibit of a Glasgow Company, Hugh McCulloch & Co, for the Glasgow International Exhibition of 1901. The designer or artist of the window is attributed to David Gauld, a graduate of the Glasgow School of Art. We do not know the history of the Window between 1901 and 1930 when it was gifted to the Lodge by David McIntosh of Scoon. It is described as consisting of five panels but the Lodge only has four and the quest is to find the missing panel so that the window can be made complete as exhibited. For the sharp eyed, yes the Window is shown in reverse, you are looking at the back, The Bishop is giving the blessing with his left hand and the HIHS on his glove is reversed. There is nothing sinister in this, it is simply that there is damage to the front of the panels and it is better to show it in reverse rather than the correct way with damage. 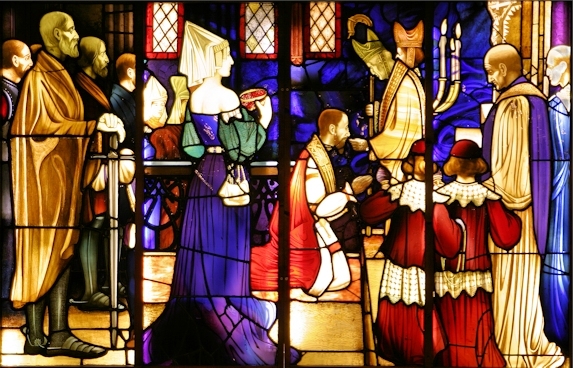 The window depicts the second Coronation of the Bruce at Scoon on Palm Sunday 1306. It is the second Coronation as the first on Lady Day, the 25th March 1306 was deemed “invalid” as Isabel the Countess of Buchan, the lady in blue holding the the Golden Circlet on a cushion was not at the first Coronation. She arrived a day late after having ridden hard on her husbands finest horses to demand as a descendant of the MacDuffs her family’s traditional privilege from the time of Malcom Canmore to place the Crown on the Kings head. Abbot Hendry of the Augustinian Abbey at Scoon, Bishop William Lamberton of St Andrews, Bishop Robert Wishart of Glasgow, Bishop David Murray of Moray and Abbot Maurice of Inchaffray were all present at the Coronation. “Let her be closely confined in an abode of stone and iron made in the shape of a cross, and let her be hung up out of doors in the open air at Berwick, that both in life and after her death, she may be a spectacle and eternal reproach to travellers.” Contemporary history has it that she was hung in a wooden cage then placed over the ramparts of Berwick Castle and there she remained for four years.